And from Jesus Christ, the faithful witness, the firstborn of the dead, and the ruler of the kings of the earth. To him who loves us and freed us from our sins by his blood, and made us to be a kingdom, priests serving his God and Father, to him be glory and dominion forever and ever. Amen. Look! He is coming with the clouds...(Rev. 1:5-7, NRSV). In this third and final installment of the Church of the Firstborn series (see Parts I and II), I will be diving into another messianic mystery tucked away in the OT. There is a fascinating text in Psalm 110 that contributes to our understanding of the NT revelation of Christ and the Church. This particular verse has a confusing textual issue, as we'll soon discover. However, with some biblical sleuthing and the right interpretative framework, you might be surprised by the picture that surfaces once we piece together the available evidence. All three of these elements—(1) Firstborn (2) Priest-King (3) Cloud Army—can be found in Psalm 110. However, you won't see all of them by simply reading one particular English version, nor can you see the full picture by an uncritical acceptance of the Masoretic Text either. It's gonna take a little excavating, but there is some hidden treasure in this hill. Psalm 110 has the most citations, quotations, and allusions in the New Testament of all the psalms. Along with Psalm 2, it is highly messianic and finds fulfillment in Jesus, the Christ, the Son of God. The book of Hebrews reveals the immense implications of Jesus' superior priesthood and ties Psalms 2 and 110 together twice: (1) They are the first and last OT quotations which bookend the opening argument (Heb. 1:5, 13), and (2) They are linked again in Heb. 5:5-6, where the Father is the One to appoint Jesus to His exalted position. To reiterate something I touched on in Part II, it is important to grasp when the Father officially declared Jesus "a priest forever in the order of Melchizedek" and said the words "today I have begotten you." Historically, the Father's declaration of these two OT prophetic statements (Psalm 2:7 and Psalm 110:4) was made official only after Jesus had been raised from the dead and taken up to heaven. Acts 13:33-34 crystallizes this point. So why is this a big deal? Well, for the purpose of our study, the timing of the Father's words is essential in order to define and clarify the oft-used and oft-misunderstood term "begotten." The Greek term gennao in the context of Psalm 2:7 and its numerous NT citations is best understood in the sense of the new creation. In other words, the Father's "begetting the Son" means that Jesus became the "firstborn" of a new creation at the time of His bodily resurrection and, ultimately, His triumphant return back into heaven to be at the Father's right hand. And like Jesus, the head of the body (Eph. 5:23; Col. 1:18), the Church will also experience a second "birth", a supernatural "begetting" by the power of the Spirit and the will of the Father. Perhaps this creative use of language is why some are stuck when it comes to Revelation 12:5 and cannot fathom how this text could refer to anyone else other than Jesus. Sadly, many are short-sighted in their interpretation and are only thinking about a historical birth in the sense of Mary and a baby in swaddling clothes. In context, the "begetting" and "birth" of this male-child in Rev. 12:5 is the corporate Christ (Jesus and His body), and it's not a natural/physical birth being depicted—it's a supernatural/spiritual birth (i.e. the resurrection/rapture of the Church). He [the Father] also raised us up with him [Jesus] and seated us with him in the heavens in Christ Jesus, so that in the coming ages He might display the immeasurable riches of His grace through His kindness to us in Christ Jesus" (Eph. 2:6-7, CSB). We really struggle to grasp the weighty truth of this passage, because we are currently in a stage of tension, the already-but-not-yet. Nevertheless, the apostle Paul isn't playing games with words and neither is God. We really will be raised up and seated with Christ in the future—as a complete and glorified body in heaven! Paul comes right out and says that Christ will raise us up and make us sit with Him in the heavenly places. How do you allegorize this away? How do you make this mean something different? If this is not being fulfilled right here in Revelation 4, then by all means—please indulge me and show me where it is fulfilled" ("The Gang's All Here," article #5, 2015, emphasis his). And so, even though there is an already-but-not-yet fulfillment (positional sanctification, as it's called), Ephesians 2:6 finds ultimate fulfillment in Revelation chapter 4. There in God's throne room in heaven, we see the complete and glorified Church: the firstborn, the priest-kings, and the white-robed "clouds" who sit with the Lamb right before He stands up, takes the scroll, and begins to judge the earth. Gary's written on this too, so if you missed it, check out "Who are the 24 Elders?" Again, I will often tell brothers and sisters in Christ under the New Covenant not to read themselves back into the "Old Testament" era. But if you are my brother or sister in Christ, then go ahead and read yourself into this next one too. When you read through this psalm and study the flow of thought, you'll discover that the book of Revelation is a thorough expansion of this ancient prophecy. There is a sure and steady move of the Messiah from His exalted position in heaven, at the right hand of God (YHWH, the LORD), back down to earth in order to wage a righteous war against His enemies (cf. Rev. 19:11-16). And, as you know, the Messiah isn't alone—He has a "body" with Him. 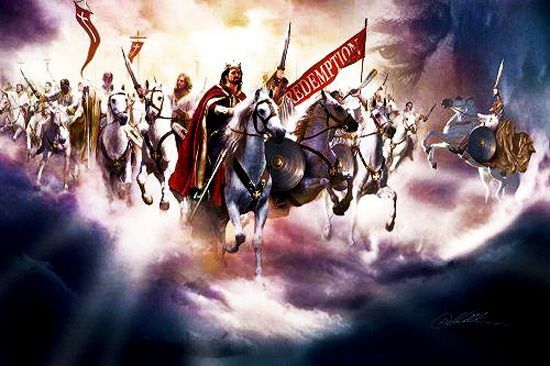 Remember, Christ returns at the end of the Tribulation "with the clouds" (Matt. 26:64; Rev. 1:7; cf. Dan. 7:13). Well, just as you might expect, "the clouds" can be seen in Psalm 110:3 and linked closely with David's "Lord" and King (cf. Matt. 22:41-46). Your people will volunteer freely in the day of Your power; In holy array, from the womb of the dawn, Your youth are to You as the dew" (NASB). With you is authority in the day of your might, with the splendor of the holy ones. From the womb, before the morning, I begat you" (The Lexham English Septuaguint). As you can see there are major differences, and it's no small task to try and piece this textual puzzle together. At first blush, I find it intriguing that verse three has the most difficult textual problem of all the places in this psalm. There is something monumental going on this verse, and if the original text is some kind of combination of both the Hebrew and Greek versions, then parallel passages containing "resurrection/raised-up-to-rule" imagery abound in Scripture and the implications for the Church are immense. David M. Hay correctly notes that the last phrase of 110:3 is 'virtually unintelligible.' The MT reads 'from the womb of the dawn, your youth [yalduteyka] are to you as dew'...leading to a variety of strained and unlikely interpretations since these words make virtually no sense. Booj describes the phrase as 'especially problematic and indeed...meaningless.' He concludes that 'some deformation must have crept in.' Although a canon of textual criticism is that the harder reading is to be preferred, there is a difference between a harder reading and an incoherent, impossible one. For this reason, Sigmund Mowinckel and other scholars prefer the LXX, which reads, 'from the womb of the dawn, I have begotten you,' a translation based on the same Hebrew consonants but with different vowel pointings [yelidtika]. Additionally, Bentzen has suggested that the corruption of the MT resulted from deliberate scribal efforts to obfuscate the meaning and its plain allusion to Ps. 2:7. Since the LXX reading is preferable, it leads to a strongly messianic interpretation, describing in Hay's words, 'the birth of a divine child' as King" (Messianic Hope, pg. 174-175, bolded emphasis mine). Now, I don't want anyone to become disheartened or overly suspicious every time there is a difference between English translations that highlight an underlying disagreement between the Masoretic Text and any other version, especially the Greek (LXX). The MT is a solid and reliable transmission of the entire Hebrew Bible, but you do need to be aware that the MT is dated around AD 1000 whereas the LXX manuscripts go as far back as 2-1 BC. What does this mean? It means that the Masoretes, who were Hebrew scribes (i.e. non-Christians) and gatekeepers of a text transmitted down through the centuries post Pentecost AD 33, would certainly want to avoid any association with Jesus as the Messiah and "begotten Son" of YHWH (cf. John 1:14; 3:16). Therefore, it is entirely plausible to suggest that the surviving Hebrew text (MT) contains a deliberate attempt to disassociate and avoid the clear link between Psalm 110:3 and Psalm 2:7. Chalk it up as just another "conspiracy theory," if you wish, but Rydelnik's explanation accounts for the confusion and incoherence between the Greek and Hebrew versions. Additionally, there is evidence from other ancient Hebrew manuscripts and the Syriac version that support and uphold the Greek inclusion of the Father's words "I have begotten you" in Psalm 110:3 (Messianic Hope, pg. 175, footnote 42). In holy splendor, out of the womb, towards the dawn go forth! Like dew, I have begotten you" ("Critical Notes: A Royal Performance" from Journal of Biblical Literature, vol. 117.1, year: 1998, pg. 96). Wisely and conservatively, Brown incorporates the reference to "dew" found in the MT but omitted by the LXX. He also includes in a footnote his suggestion that the "womb" refers to Zion, which is frequently associated with maternal imagery. For evidence he cites Isaiah 66:7-9 and Psalm 87:4-6! Your people will offer themselves freely on the day of your power dressed in holy splendor/garments; from the womb [and] before the dawn, like [the] dew I have begotten you." The LORD sends forth from Zion your mighty scepter. Rule in the midst of your enemies!... [t]he LORD has sworn and will not change his mind, 'You are a priest forever after the order of Melchizedek" (Psalm 110:2, 4, ESV). One day, and one day soon, the LORD will "remember" His covenant promise to the Church. The Head of the body has already gone before us as a forerunner, the prototype of what is to come. One day, and one day soon, the earth will not be able to contain the dead any longer and will bring forth (give "birth") to the new creation (Rom. 8:22-23). One day when the fullness of Gentiles has come in (Rom. 11:25), the Father will say to us too, "Today, I have begotten you." Thus, as we have discovered in this study, a key prophetic text in Psalm 110:3 helps to complete the mystery of Messiah and His body. There are elements in this text that align beautifully with other passages that depict the "birth" (resurrection/glorification) of the Church. Isaiah 26:19, 21 – The earth gives birth to the dead in Christ, "Your dead will live..." And here we find the presence of "dew" imagery again. Dew is symbolic of renewal and blessing—especially an early blessing such as the pre-dawn (Day of the LORD) resurrection and rapture before the earth is judged. Isaiah 66:7-9 – The "birth" before Zion's "labor" is the "begetting" of the Church, the male (Grk. arsen). Christ was begotten first, but His body is not far behind. The male (arsen) who is born from the earth is a collective, a nation of priest-kings resurrected and glorified in one day. Check out 2 Esdras 4:40-42 for a thought-provoking backdrop to these texts in Isaiah about the coming earth-birth of God's children. Revelation 12:5 – This one, solitary verse is pregnant (pun intended) and full of hope for the one who knows the backstory. It should come as no surprise, but we find Psalms 2 and 110 synced up again in this verse. The Firstborn (Church) is given authority to Rule (Ps. 2:7-9; Ps. 110:2) and taken up to God's throne...just...like...Jesus, the preeminent Priest-King (Ps. 110:1; Eph. 2:6)! Feel free to search for more Psalm 110:3 alignments, 'cause I'm sure there are many other passages that affirm the reconfiguration shown in this study. Hopefully, this will suffice for now, and I pray that I accomplished my aim in the Church of the Firstborn series: The Church goes first! We will be raised up, seated with Christ in heaven, and then return with Him to rule and co-shepherd the sheep nations with an iron rod. Keep watching and waiting, brothers and sisters. Our "Begotten Day" will be here soon. Come, Lord Jesus! An excellent and faithful conclusion to the series. Here's to hoping He takes this cloud home with Him ASAP. Yes! An excellent conclusion that was well worth waiting for!! "Therefore, it is entirely plausible to suggest that the surviving Hebrew text (MT) contains a deliberate attempt to disassociate and avoid the clear link between Psalm 110:3 and Psalm 2:7. Chalk it up as just another 'conspiracy theory,' if you wish, but Rydelnik's explanation accounts for the confusion and incoherence between the Greek and Hebrew versions. Additionally, there is evidence from other ancient Hebrew manuscripts and the Syriac version that support and uphold the Greek inclusion of the Father's words 'I have begotten you' in Psalm 110:3 (Messianic Hope, pg. 175, footnote 42). In summary, neither the Hebrew or the Greek versions have the original text, and we need both of them in order to reconstruct what was lost in transmission." I'm not sure if there was a fragment or scroll containing Psalm 110 in the DSS. I'll explore that. This text makes most sense to me when looking at the millennium period. The "dew" and the "dawn" are here combined best in syntax to understand what it might mean ("dew" as describing a vast amount of droplets at the beginning of a new day with Christ reigning Psalm 30:5, like the stars as a picture of Abrahams seed). I have translated Luther here myself into English best I could, I hope you will understand what he meant to say. Annabel, thanks for the other translations. I was curious about that. You did well with the Luther translation, from what I can tell. Also, your point about the dew is interesting and makes me wonder how loaded the idea of morning dew is. the Bible talks about dew (TAL Strongs 2919 and 2920) 36 times in the Old Testament. I could not find it in the New testament? In Judges Chapter 6, the dew on the fleece was a sign, and there are some prophetic implications possibly? After your victory (of v.2) your people will freely offer sacrifices to you in holy regalia. Your children will be born to you like dew from the dawn. This makes the most sense to me also, what an amazing picture this creates. Jesus said As long as He is in the world, He is the light of the world; the Strong Delusion and Man of Sin will arrive with the Abomination of Desolation; that will be Lucifer "Light Bearer", "Eastern Star" "Shining One". The Dragon, Devil, Satan, Serpent that has deceived the entire world (Rev 12:9) will cause that Desolation to come on the world, accepted as Messiah/Moshiach. Jesus warned He came in His father's name and was rejected, but that another who comes in his own name will come and be accepted. Notice when the 2 Witnesses are killed in Jerusalem (Rev 11:9-10) people will send gifts one to another; that is a description of Hanukkah/Christmas, the day known in Rome as Saturnalia, the celebration of the birth of Saturn's son, Horus, Attis, Mithras, Jupiter, Zeus, Dionysus, Helios, Sol, Hercules, Bacchus, Apollo; aka Solis Invictus the Unconquered Sun. I humbly suggest reading Dan 9:23-27 "70 Weeks" without "Private Interpretation", before the Age of Grace ends. Thanks for this essay...I was wondering how the covenant people of Abraham will be included with the church ruling and reigning with Jesus? At the end of the 70th week, they will look on Him whom they have pierced and mourn for him as a lost son. The covenant people for whom Jesus first came to, will be once again accepted by God and we, the gentile believers during the church age, have been grafted in to the main tree. So, how does the main tree, Israel, rule and reign with Jesus during the millennium? Hey Susan! Thank you for your question. It's a good one. Building off of Sherry's response below, it is important that we define Paul's "olive tree" and "rich root" from his illustration in Romans 11. I realize that many just assume that Israel must be the tree, but that tends to confuse things especially since Paul goes to great lengths to maintain a clear-cut distinction between the Jew/Gentile nation [Church] and God's covenant nation Israel throughout Romans 9–11. In my understanding "the olive tree" is the entire redeemed family of God chosen from mankind who are "children of promise" (borrowing another Pauline phrase from Gal. 4:28-31). Take a look at Romans 11:24, "...the natural branches grafted into their own olive tree" + Romans 9:4-5 where Paul says that to Israel belongs "the covenants" and "the promises," the "forefathers" and "the Messiah" by physical descent. We see here that Israel and the olive tree are distinct terms and not are not really one-in-the-same. The Gentile-dominant Church is definitely a wild branch grafted in to a family tree that begins in earnest with the Patriarchs (Abraham, Isaac, and Jacob), and it will be an easy grafting back in for the future remnant of Israel during the Tribulation once they come to faith in Christ (Rom. 11:23-24). Therefore, at the start of the 1,000-year reign of Christ on earth, Jesus will be both King of Israel and Ruler of the inhabited earth. My understanding is that as co-rulers with Christ we will assist in shepherding the Gentiles [nations] who survive the Tribulation and enter the kingdom. Israel will still be Israel, and they are given the Land according to God's promise. The 12 tribes will have their allotments (Ezek. 48), and the Church will be back and forth from the New Jerusalem (our home) to our assignments on earth. Christ the root and the vine! Excellent linguistic forensics, Jeff! It is overwhelming to know we will be made one with Jesus. Worthy means worthy! All sin and sin-nature is washed away as we commune with him. Amen! Thanks, Daniel! It is overwhelming to dwell on the rights and privileges granted to all the co-heirs with Christ. Ah, and to be rid of this sin nature. Yes! Yes! That's the spirit, Gail! Serving the children at Sunday School will help to prime your heart for heaven (Lk. 18:15-17)! How fascinating it will be to think, feel, and experience the "Present" tense as God sees everything. The past, present, and future all rolled into one, that we don't see it as right now. I appreciated the inclusion of Isaiah 26:19. Your dead will live; Their corpses will rise. You who lie in the dust, awake and shout for joy, For your dew [is as] the dew of the dawn, And the earth will give birth to the departed spirits. 2“But for you who fear My name, the sun of righteousness will rise with healing in its wings, and you will go out and leap like calves from the stall. Romans 8 is one of my favorite passages: No condemnation, incomparable glory, revelation of the sons of God. Amen. Context is king, but even the depth of some of the root words are astounding. And all very fitting of different aspects of the R/R as far as the Body of Christ! - figurative of young warriors of king established by, with flashing weapons, like dewdrops. Morning cloud... That goes away early... Oh yeah! It's interesting that the Winnowing of Barley has the barley tossed up into the air, to remove the chaff and bugs... Barley is delicate and not put under a Tribulum to crack the hard shell around the kernel like Wheat is. The dew imagery is pretty stunning. It's even more stunning when you dive deep and see how much significance God has attached to individual words. Note: Time references and morning. Along with a reference to timing we see a *portion*. Yes, it is amazing that though it is G-D's story; He has given us an incredible part in it to play. We were perfectly crafted to fulfill that part and loved uniquely by the One who knitted us together from the very first. In a way we are each a first fruit of the work of the hands of the LORD. Each of us uniquely and lovingly crafted by the Potter with a beautiful and specific purpose. Is it no wonder that He would come and die for us that we may be with Him forever?! All to Him I owe. Sin has left a crimson stain, He washed it white as snow. Rest in that simple truth my brothers and sisters. Rest in that simple Truth! Amen, and don't you KNOW I've got my calendar marked! Jupiter departs the altar as the Moon enters and the bright morning star (Venus) comes to meet it! All at the same time as the Draconid and six other meteor showers. Bonus: Here's a screen shot I took this afternoon when I posted the response above. Once again, it was not my intention to post that at 3:33pm! The screen shot was taken at 3:33pm as well and shows the unfolding dance in the heavens with the Moon and Venus framing Spica in Virgo. Jupiter is solidly on the altar but now moving for the exits in one-month's time on 10/11. Absolutely wild! Further confirmation in my opinion of God speaking to us to continue to look and watch! HIS return is so very soon! I was talking with my son this past week wondering if we may see the scriptures played out in the heavens prior to the actual event here on earth. Thoughts? "May we see the scriptures played out in the heavens?" Absolutely. That's what's happening and has been happening from the beginning. I direct your attention to (Psalm 19:1-5 ESV). **Quality of this streaming video is not that great. I highly recommend buying the DVD from Rick. I give them to seekers and atheists alike. Start with the second link and work your way to the first. Keep in mind that Rick is NOT an astronomer...he is an attorney. That seems rather fitting to me as Saul of Tarsus was an attorney of sort as it were. The presentation is not perfect, but that is what makes it so good. Rick reveals a piece of the puzzle as given to him. I for one am thankful that he was obedient and followed through on his G-d nudge! Gary, what do you mean 2nd sign in the heavens in 26 days??? I'd read it but now I see, thanks. Amazing, Jeff! Thank you. I love how the articles on Unsealed push me deeper still in study of the Word. 2. First is last and last is first. Its amazing that our generation has a deeper understanding of scripture. My mother had a fierce love of Christ and studied His word intently. I have her old worn out bible that she studied from for 50+ years. Whenever I discover something new - something that I never grasped before that reaches out and grabs me - I pull out her old King James bible and look up that scripture to see if it's something she "got" and highlighted. Many times I find that she apparently didn't. You got it, Deekabee. The first will be last, and the last will be first. What an amazing gift you have been given in your mother's well-worn Bible. It really amazes me as well to be in this generation where the end-times portions of Scripture are coming together and being understood by so many in the body. I thank the LORD that He has kept me hungry and allowed me to be equipped to study deep into the Word. It is my privilege to contribute in some measure to the edification of the body of Christ in preparation for the glory to come. Just as a remnant in the Church unearthed the gospel and other doctrines during the Reformation era, we are seeing a similar unveiling and unsealing of the eschatological portions of Scripture made plain for believers who are alive to see the return of Christ. Very surreal and exciting to be alive right now in our generation! Brethren, I'm worried about other brothers and sisters on youtube. Many seem to be returning to the Law, the Torah which is the enmity Christ put to death on the Cross. Many seem to be going back to practicing the Law and almost boasting about it although saying that they are attempting to worship at a higher level so to speak, respecting God all the more by respecting His Law through practice. All the more reason why when people ask me scriptural questions I follow it up with a prompting that they look it up for themselves. Don't take my word for it! Better to learn how to fish and know what you're eating than to just eat fish and having not a clue as to whence it came! Sorry, but this brings to mind one of my favorite movies. Start watching at the 2:37 to 6:00 for some of the BEST parts and enjoy but it's all good! Some people miss the forest for the trees! But seriously, that is the world we live in isn't it? Keep praying and sharing the good news! No, it's not just you. I've noticed it also.... a lot of us have. The Gospel & the message of Grace are taking a huge hit right now. As a non-Christian, I would like to ask a question about this matter of the age of Law and the age of Grace. Since Christians believe that the age of Law has passed, then what laws do you follow? nafeesa, what must a person do to be saved? Follow the Law, the 10 commandments, say a simple pray to Jesus? It's as simple as that? There is no ceremony, there is no prayer or specific words to be said. Only a repentant heart for one's sins and a confession to Jesus accepting Him as Master, as Savior, Redeemer. Each person may confess in a different way, no two people are the same. As far as what laws do followers of Jesus practice, Here are Jesus's words: Jesus said unto him, Thou shalt love the Lord thy God with all thy heart, and with all thy soul, and with all thy mind. This is the first and great commandment. And the second is like unto it, Thou shalt love thy neighbour as thyself. On these two commandments hang all the law and the prophets. Upon belief and faith in Jesus as Master and Savior and living in the Spirit, not in the flesh as we once were following all the things of the world, you will practice them just out of respect for Him, out of Love for Him, because of the joy and peace He freely gives by His Grace. As far as the age of Law, what does Paul say concerning the law and the old covenant? 2 And you He made alive, who were dead in trespasses and sins, 2 in which you once walked according to the [a]course of this world, according to the prince of the power of the air, the spirit who now works in the sons of disobedience, 3 among whom also we all once conducted ourselves in the lusts of our flesh, fulfilling the desires of the flesh and of the mind, and were by nature children of wrath, just as the others. Going back to the law was a big issue in the early church and will be so again. Paul's attitude towards it (especially when it encroaches on salvation and/or the believers standing before God) can be seen in Galatians. Keep watch over your heart! There is definitely some apostasy going on. The law does not and cannot save. Only Christ. It saddens me to see many whom I thought were brothers and sisters in the faith fall from grace. They no longer divide the Scripture, but simply mingle them all together. Yep. To adapt a well-known phrase, "A mist from a YouTube pulpit becomes a fog in the virtual pews." Be very careful who you give your time and attention to on YouTube. There are so many self-proclaimed teachers out there who are either willfully or ignorantly violating Paul's words to Timothy in 1 Timothy 1:3-11.
nafeesa, What a blessing it is to have you here and that you would ask such a great and thoughtful question. A QUESTION FOR YOU: What brings you here to ask it? RI gave an excellent answer at length. In Christ we are not called to be saved by the law for the law does not save. Christ fulfilled all the law because we could not. It is simply impossible. The Father shows His love for us in that while we were still sinners, Christ died for us. Jesus is the One who kept all of the law. It is by Him and through Him that we live. ...to expand upon the commandment given us by G-d in Christ as shown above. As Christians we keep the law (10 Commandments) not because they are prohibitory and regulatory to our lives. We understand the Commandments as BEING LIKE A RECIPE to good living and living a full life. A life pleasing to G-D that honours Him because we love His Son Jesus and thus love Him too. As being baptized believers in Christ we are given His Holy Spirit to guide us and teach us. He is the Spirit of Truth. Living our lives IN CHRIST is the key! By knowing Jesus we know the Father. By loving Jesus we love our Father. JESUS IS THE WORD AND HIS WORD IS LOVE! Want to know more? Ask. Ready to say, "Yes" to Jesus? Read (Romans 10:9-13 ESV). If after considering these things you are convinced that Jesus is who He says He is, all you have to do is talk to Him. We call that praying. Tell Him your heart and ask Him to come into your life. Ask Him to dwell in you and be the Lord of your life. Wholly place your trust in Him and in Him alone. Courageously seek Him. Humbly accept Him, for such people He did come. Christ Jesus is the fulfillment of the law for us, since by the Law we could not achieve it ourselves. Beloved, we are now children of God, and what we will be has not yet been revealed. We know that when Christ appears,a we will be like Him, for we will see Him as He is. Who then overcomes the world? Only he who believes that Jesus is the Son of God. There is now therefor no condemnation for those in Christ Jesus. For what the Law was powerless to do in that it was weakened by the flesh, God did by sending His own Son in the likeness of sinful man, as an offering for sin. He thus condemned sin in the flesh, so that the righteous standard of the Law might be fulfilled in us, who do not live according to the flesh but according to the Spirit. Some of the discrepancies people are having is because they're looking to books since removed from the 66 book canon to books like Enoch, 2nd Baruch. While I don't think it is bad/wrong, they're giving more credence to these books vs the New Testament and the new covenant that Christ made with all peoples willing to have faith in Him alone. Itching ears and wanting to do more for greatness in Heaven is dangerous. Thank you for your replies and may the Grace and Peace of Jesus the Christ be multiplied unto you and all the brethren. Maranatha. And when the Pharisees heard that Jesus had silenced the Sadducees, they themselves gathered together. One day an expert in the law stood up to test Him. "Teacher," he asked, "what must I do to inherit eternal life?" He answered, "'Love the Lord your God with all your heart and with all your soul and with all your strength and with all your mind' and 'Love your neighbor as yourself.'" Of these three, 1 Enoch for me is a bit more than just Reference and History. I do consider it inspired, but probably corrupted a bit. There are also two other "books of Enoch", known as 2 Enoch (Secrets of Enoch) and 3 Enoch which are Gnostic in nature. It is not meant to be canon, says it up front in early chapters. And it is not part of the Salvation narrative of the bible. Scripture of the Bible we have is our source for validation. I do wonder though in the near future when the Age of Grace is over and when there will be a drought of the Word, and all of the bibles are probably removed, destroyed, etc If this book (for the last generation) might finally come out of hiding (Aramaic version). Nafeesa, this is an excellent video on salvation. It's as simple as ABC. Hey guys, I have to say I was disappointed not to be raptured away on the 11th of Sept. and I'm sure y'all were too. I know someone already mentioned about the "Red Heffer" that was born last week. But I seen this interesting YouTube video on it from TYGREEN, Titled: How does this Red Heifer, Herald the Tribulation Period is Near. Basically, he mentions that the RED HEIFER must be sacrificed before it turns 4 years old, which if you do the math would seem to tie in perfectly with the 7 year tribulation, and the abomination that causes desolation @ the halfway point. So if the heifer was born last week. and the mid-point of the tribulation is in 3.5 years. that would suggest a rapture must take place within the next 6 months... I personally would imagine it would be within 2018.. But to me it was a confirmation that his coming for his church is still tangibly close. I am just trying imagine the order of events. how things would pan out..
1. Deal of the century gets revealed by Trump, Promising rebuilding of temple / land for Palestine. 3. A period of chaos & panic & mourning breaks out because of millions of missing Christians, young kids and babies. 4. I would imagine, something happens to America by then. I would be very interested to see other people's suggested order of events. I for one have never been super convinced that the "Feast of Trumpets" (an inaccurate name) has to be the festival of the rapture. It could happen on a FOT, but Shemini Atzeret and Pentecost make just as much sense, if not more, to me. The Church would be wise to start watching EVERY DAY. He's coming, and 2018 looks like a very good bet. @Jordan, I am sorry on your disappointment. Last fall was a challenging time for me as well but I learned something very valuable in that. I learned to hold fast to scripture and not get swept up by what I wanted to hear driven by voices from the four corners of the Internet. It was a great teaching and reminder to me. I did not expect to see our blessed hope yesterday. Because of (Revelation 12:3 ESV). G-d is providing signs to us of the coming Day. Along that path are specific events that we have been discussing here at length. The next one that we're waiting for follows on the heels of what we call the Revelation 12 Sign, or the Bible calls "a great sign". Have you seen this sign? Have we seen this sign? Me, personally? No, not yet. My studies suggest that this sign will occur with the NEXT New Moon in October. Follow scripture and you will see what we are to expect before the Rapture. (Revelation 12:4 ESV) is part of the group discussion you will find in the link above. Birth of the man-child, the Church, doesn't occur until (Revelation 12:5 ESV). We're getting close. Very close I believe. But as Micah Daniel observes below, "we now have more time to better represent the Lord." This is perhaps one of the greatest lessons of all that disappointment can bring. The knowledge that we have more time to share the love of Christ and be His Ambassadors here on earth. The Ark has too many empty seats. There is plenty of room for all. Let us be about the business of our Master and invite all who will come to the blessed event. The wedding feast awaits! A place is reserved for you. Come experience the joy and be bathed by the splendour of our King. We have been blessed with time to do the work of our LORD. I give thanks everyday for that and thank Him that he blesses us to be a blessing...graces us to be graceful...is merciful that we show mercy...and loves us to be loving. Talk about your feelings and share them with your brothers and sisters in Christ. Seek mature believers who can help you learn. Seek seekers who want to learn and become the teacher G-d has made you to be. Follow Him and Him alone. Rejoice and live Victoriously for the Lamb has overcome! Your message made a lot of sense to me. One of those slap your head and go d'oh moments. Yes of course you are right. Yes the Rev 12 sign (Sept 23 2017) was the big disappointment for all who thought it was the date of the rapture. I had turned my back on God from my late teens onwards, and only came back to him this year. I am 39 now. Thank God. It was then I discovered about the Sept 23 sign last year and got very excited, trying to convince my wife, who is still a non believer, my mother who is very Christian and reads the bí le for hours each day, yet still insists that there will be a post trib rapture. She calls me deceived because I believe in pre trib. And she won't listen about the Sept 23 sign. She even trys to convince everyone that the trib won't start tíl 2029,she keeps telling us all the LORD told her. Very hard to talk to her to convince her she is wrong. My wife just brings down the shutters everytime i talk bible. So sad. I would ask that you include her in your prayers. But back to my original point. Yes your reply made perfect sense, there are still several verses to be fullfillment before the rapture. Namely the dragon with 7 heads, then Draco comets tail in oct.
Makes perfect sense. We are so close. I have read many of the article posted here and over at REV12sign.com over the past few months and i recognise all the names, just never really commented. But I so appreciate the ground work and Bible digging and analysis you all do in your articles. Blessing to you all. I'm tired of getting my hopes up and I'd rather just focus on the grind, focus on keeping myself pure, focus on my family and doing the daily work that the Holy Spirit has me to do. I like watching but I did after the disappointment last year from the sign fall away to some extent. I don't want to do that again. Occupy until He comes, expect Him always, keep watch. Date setting is in a way setting yourself up to disappointment as it has for so many before. Jordan, I am glad you came back. I hear you when it comes to your wife not wanting to hear about the Bible. Many years ago, that was me. I didn't want to hear it from my wife. G-d had other plans and turned my heart around and now here I am doing what I said I would never do. Be a Pastor. Have you ever seen the movie Courageous? It is not a movie. It is a calling. Only G-d knows what is to be. If you would have told me years ago that I would be here today doing the things that I do in His Name, I would have told you, "You're nuts". Once I was that guy who didn't believe and didn't want to hear about it. Now I'm another Watchman holding tight to the faith that has been given me and proclaiming the Name of Jesus Christ. Faithfully lead with hope and love! But G-d had other plans. I will be praying for your family. Keep the faith! Annabel, I have to share something regarding your Oct 2/3 "window".... it's kind of goofy, and silly, but it gave me pause when I learned of it. I thought it was an interesting coincidence to your "window" .... maybe we will "turn" into a new creation & fly away on that day too. Ya, it's been disappointing but nothing has changed except we now have more time to better represent the Lord. I for one could do a much better job at work. I is so easy to get caught up in the trivial things of the world. I now I need to be more busy about the Lords work. Giving the gospel and acting out the gospel are two different things. My we use this time given to us more wisely than we have in the past. He is coming, and nothing has changed except our prospective. Come Lord, even so come! Pastor Sandy Armstrong has made the case for the Jewish calendar being off by a month. He said they didn't honor the equinox last spring and started the new month but it wasn't on the new moon but in the middle of a lunar cycle which they are not allowed to do according to scripture. I have stated before that I do not believe everything that Pastor Sandy teaches but we all see dimly right now and some of what he says is still confirmed in my spirit. In any case it is not necessary that he be correct, we all see the day approaching and the pieces God has put in place will fall into place in His perfect timing. Maranatha. The Sanhedrin used to keep the calendar. In those days many things went into the calculation of the months and adding the leap month. They took into account the new moons, yes, but the harvest, weather and any conditions that might hamper observance of the Passover. Conditions had to be *right*. Our modern Hebrew calendar doesn't take all those things into account. So far I have found his calendar accurate and reliable in fixing known dates in history. It matches Sabbaths to the solar calendar and Hebrew calendar and takes some getting used to. I am working on a 2017-2018 model to see how it all fits with signs in the heavens as given in Revelation 12 and 15 and the appointed times, feasts and observances. So upon reading Revelation Chapter 12..again and again and again, I postulate the series events I listed below have taken and are about to take place. 1. The Great Sign of Rev Ch 12:1-2 happened last September 2017.
coming October...during the meteor shower. 3. The child (corporate body) will be born. 4. Said child (corporate body) is raptured to Heaven. 5. The women flees into the wilderness. Where and when remains unknown. powers and principalities and spiritual wickedness. Don't give up hope yet, I think we are about to leave. It has been 4000 years from Adam to the Christ and 2000 years from Christ to now. The Sixth Day is about to end and so is the age of the Church. The immortal angels that fell will die like men, and their positions will be replaced with us, who were once mortal and are now immortal. The first shall be the last, the greatest the least. You bring up an excellent point about the immense power available to believers in the body of Christ right now, even during this present age (Eph. 1:19; 6:10). However, in order to access our Father's power we must stay close to Him and not leave the house, so to speak. Far too many of our brothers and sisters are still entangled in habitual sin, struggling to break free from under the weight of guilt, shame, lies and deception. They are forfeiting their armor and fool themselves if they give lip-service to Ephesians 6, thinking they have protection and yet continue to go on sinning. Living a double-life and wavering between the old and new natures is an invitation for the unseen powers and principalities to have their way with you...Paul's states that this should not be so of the true child of God (Eph. 4:22-24). Thank you again, Annabel. Keep standing firm in the Lord. Thanks for your comments. and encouragement. I havent seen that movie: "Courageous", but I will try and watch it this evening. Hopefully can rope in the missus into it too. she is soo resistant to hearing the word of God.. she even uses pretty much exactly the phrases mentioned in 2 Peter 3:3 "Above all, you must understand that in the last days scoffers will come, scoffing and following their own evil desires. They will say, "Where is this 'coming' he promised? Ever since our ancestors died, everything goes on as it has since the beginning of creation." Our God is surely such a wise and powerful God, that he knew exactly how the end would be, right from the beginning. Slightly off topic, and I'm not sure if anyone has asked you this before Rich, but why when you type God, do you write it as G-d? initially I thought it was an issue with the letter "o" on your keyboard, but then I seen other words with the letter "O". Just curious that's all. Recently on my walk from the bus stop to my office, I have taken note of any numbers that happen to jump out at me... yesterday's was: 270 (it was on a van that drove past in large letters) and today was 109 (it was on a bus that drove past me). Then when I got into the office and checked them in Strong's concordance: they mean: 270: "I Mow, reap, collect" & 109: "(in to the) air". Kind of thought that was pretty cool. Also apparently: not sure how true it is, but on the feast of Trumpets: the 1st sighting of the new sliver of a new moon on the 10th of Sept was seen @ 7:26.. and the Strong's concordance for 726 is: "Raptura" - how awesome is that! Yes I am amazed that my mum has been reading the bible every day for hours per day, and she strongly holds onto the post-trib rapture view. initially when I came back to the Lord in January of this year, I thought similar to Gary's comments, that we were suppose to go through the tribulation, that it was a badge of honour. Jesus died for us, so we must prove our love for him, and be willing to die for him. I held this view for a couple of months, but so many video's and scripture, and scripture teachings I saw of people who really seemed to know their bible, like Jacko from YT: Gods road map to the end, and many others, I began to question it. and look into it more, then I went into the pre-trib camp.. I wavered over and back for a while, but now after researching it almost entirely for the past 9 months, and seeing many of these articles, and realising that the last 7 year period is mainly for Israel and not for the believing loyal church. God uses the Church by rapturing them to make Israel jealous and bring them to salvation. "Come, my people, enter your chambers, and shut your doors behind you; hide yourselves for a little while until the fury has passed by.For behold, the Lord is coming out from his place to punish the inhabitants of the earth for their iniquity, and the earth will disclose the blood shed on it, and will no more cover its slain." She thinks the chambers that Isaiah talks about, is your prayer closet?!! “Before she was in labor she gave birth; before her pain came upon her she delivered a son. Who has heard such a thing? Who has seen such things? Shall a land be born in one day? Shall a nation be brought forth in one moment? For as soon as Zion was in labor she brought forth her children." And she says, "what has that got to do with anything? ", she doesnt see that the labour is the Tribulation, and the woman in Labour is Isreal. She pay's no head to the Sept 23 2017 sign..
She keeps calling me deceived.. she scoffs at all "those wobbly Christians". but anyway, she is saved. thank God for that. But boy is it tough talking to non-believers and it is almost tougher talking to believers who have mis-conceptions and mis-understandings, and try to convince you that you are the wrong, and that you are the one who is in a deception. Obviously we are saved by grave through faith - and not by works lest we boast. So simply confessing our sins before God, Confessing that Jesus is our Lord and Saviour and believing that Jesus's death on the cross is enough to cleanse us of all your sins gets us salvation. It seems so easy.. There must be a catch.. Why arent more people jumping onto that ark before the flood, everyone thinks you are trying to trick them into something. Can the Lord truly love us that much.. Can the Lord truly be that Generous. Obviously the answer is a resounding YES. But yet the bible says, "if it is hard for the righteous to be saved, what is to become of the wicked?" But who are the Laodician Church? Are these people who didn't truly believe in their heart? What happens to people who truly believed 20 years ago, gave their live to Jesus, and then like me fell away, but never came back to Jesus? will they be raptured? because you cant lose your salvation. so my question is, obviously non-believers get left behind, but what about believers who have back slid-den? I'm following this one, Jordan, to see how others respond. I've had questions about this too. I have a brother and 2 children that accepted Christ and were filled with the HS and baptized as teens but have fallen away and live very sinful lives. My brother won't even come close to having a conversation with me about it, but my children insist that they believe but just don't believe it's going to happen now and have plenty of time. Are they sealed? I firmly believe that both the Church of Philadelphia and Laodicea are in existence at the same time, at the event of the Rapture. I also believe that since this biblical year of 5778 is called the year of the Open Door based upon the number meanings that this year is our Door that has been open, and no one can shut. The implications by some is that 5779 is the year of the Closed Door. This would mark a transition period, a point of decision for all, and that there be no more delay (Rev 10:6). 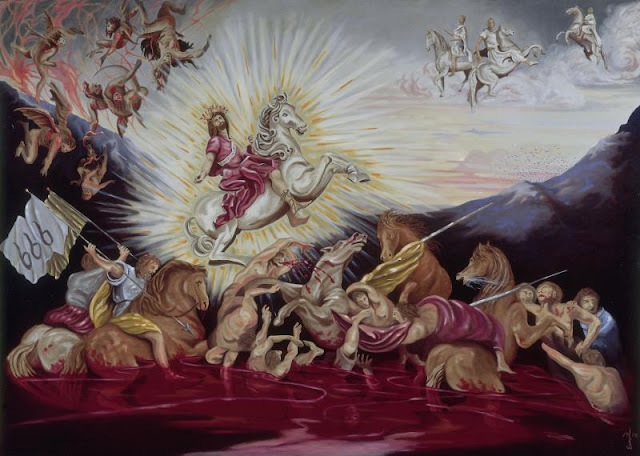 I find Revelation 10:1-7 quite remarkable in this as an association with this event. There is an overall theme here about the "Doorway" (all throughout scripture). Those of the Philadelphia camp will enter through the Open door given to them that no one can shut (Rev 3:8 / Rev 3:10-11), but themselves (Isaiah 26:20). They are like the 5 wise virgins who enter through the door with the Bridegroom and the door was shut. Notice it doesn't say that the Bridegroom shut the door specifically (Matthew 25:10). In Isaiah 26:20 we read: "Come, my people, enter into your rooms [Chambers] And close your DOORS behind you; Hide for a little while Until indignation runs [its] course." Those of the Laodicean camp will be busy in the world trying to buy and miss the event. The door is closed to them and they are knocking to get in, but the Lord says I don't know you (Matthew 25:11-12). In Revelation 3:19-20 we see the Lord still loves them, though he must rebuke and discipline (tribulation? ), even after he had warned them to buy from Him Gold tried in the Fire, White Linen to cover their nakedness, and Eye Salve to open their Spiritual eyes (before the Rapture?). He calls them to be earnest and repent. And He still calls to them, knocking at the door (from the other side of the closed door), and if anyone hears and opens this door he will come in and dine with them, and they with Him. This is the only way the door gets opened. The hour is late, and it is almost upon us. On a personal level I have family and friends I feel will miss the Rapture blessing. I don't like this idea much, but it is not up to me to decide either. So I take courage in the above in the hope that they will get right with the Lord during the Tribulation, before their last breath. Though they may suffer greatly, I will still see them on the other side in eternity. Which is much better than not seeing them at all. Busy is good (in this context), Jordan! I tend to boil things down to a most basic component. The simplest answers can be some of the most profound. Will there be a day that I fully comprehend the mind of G-d? I don't think so. Can I know every move of His hand in my life and the lives of my loved ones? No. May I understand and trust the nature of His heart? If we're honest, we know enough about our Father to both love Him and revere (fear) Him. Not an anxious fear, but with reverence and respect for who He is. Not because He can destroy us if we don't, but because the maker of heaven and earth loves us. There is nothing that was (or is) made that was not made without Him. We are all an original creation in the LORD, an order of first fruits of His hands! No wonder He gave us prayer. No wonder He gave us His Holy Spirit. Can you imagine a life living in wonder about this all powerful G-d that moves heaven and earth and is yet personally unknown to you? Oh, yeah, that's the way it used to be! Take Rahab for instance. Read up on the days that Joshua led the children of Israel into the Promised Land. 40-years in the wilderness and STILL the people of Jericho know and fear the G-D of Israel. Rahab is one who revered, hoped and was obedient to the LORD. She didn't know Him as we do or as Joshua did, but she held out hope that He would meet her and accept her and her family. There are many great and deep lessons in her story. A woman living behind walls of denial that held hope of deliverance in face of Armageddon. The end of her world. The final battle that Jericho was doomed to complete in a full and final utter defeat. And yet where do we find her today? 6 and Jesse the father of David the king. Rahab the *harlot*, mother of the kinsman redeemer of the Moabite Ruth. Ruth herself a product of the incestuous union of Lot and his daughter. Both predecessor and integral in the line of David the king and Jesus Christ our Lord. If we may have such hope that G-D will make such things out of such as these? What will He do with those who today seem far away? Can you return from such a wandering? the way of his own heart. He uses us to reach other people. Miracles most often require a person to be part of the miracle. We do that best when we are at our best. If as men we loved G-d with all our heart. Loved our wives with all our heart. Loved as fathers with all our heart. Lived each day with all our heart. Would that change us? If we did all of these things in humility and out of reverence for the One who placed us in this station of life; would it invite others to change as well? Change of their own free will? do also to them, for this is the Law and the Prophets." A direct quoting of Jesus Himself saying, essentially, if you want to be loved, you must love unconditionally first. It's like saying, G-d loved us first in hopes that in our free will we might honestly and openly love Him in return. As a matter of fact, didn't He do just that? He kept the law before we even knew it! He keeps it perfectly that we may keep it as well. WOW!!! That blows my mind! To what lengths did (does) He go for love? What does His love look like? ...and what does that look like in the flesh? Christ hung on the cross! Buried and risen on the third day. Ascended, now and forevermore seated at the right-hand of the Father in heaven! That's what love looks like. He died for His beloved. He died for us. He died for you. He died for me. If we love like this, what is the response of those of whom we love? Indeed, all of these things are fruit of such love. As surely as we know that "God is love" (1 John 4:8 ESV) we know that the word "love" as given in Paul's letter to the Church in Corinth by the Holy Spirit can be substituted with "God" and retain its integrity. If this is the heart of G-d, then to what lengths will He go to reach those who have backslid? Who will He not use? Is the body and blood of Christ sufficient to cover those so hopelessly lost in their blindness that they cannot see the Light of day for the darkness that this world crash dives into daily? It is to Him to be the Judge. I know that in His death, death is finished. This is my hope. This is my faith. For even I ask these things of those who have passed before me not knowing their status before the LORD. As much as I know love through their touch, I pray G-d's merciful grace at the judgment. Pray on these things but above all be the BEST YOU you can be the to glory of G-D! Oh, and why do I use a "-" when rendering the name of our Father? It is a Jewish tradition that treats His name with reverence. It is a reminder to me to hold His name dearly and treat it with care. Keeping that in mind I also cherish that I may call Him, "אנא", which literally means, "Dad or Daddy!" Both personal and profound. Blessings to you and yours each and every day! We all know there is One narrow gate through which we may pass. As I say, there is a narrow path we must walk that is EXACTLY TWO FEET WIDE. One left foot and one right foot. The two feet of Christ. Wide is the gate and great is the path that is travelled by the world. Is it any wonder Jesus gave us this truth IMMEDIATELY AFTER giving us the Golden Rule? I continue to pray for those in my family who are far from G-d. I hope for the salvation of those who have passed before me. Those who I love(d) so dearly but at a time that I myself was far from G-d. Thank you, Pastor Rich. You - like those on Unsealed that labor endlessly to teach and clarify - are a blessing! And I thank Him every day for those - like you - in this ugly world who have been a light for all to see. I found Romans 10 to be particularly a good chapter for those who seem to be returning to the Law (as though it is a part of salvation). Because they were ignorant of God’s righteousness and sought to establish their own, they did not submit to God’s righteousness. Christ is the end of the Law, in order to bring righteousness to everyone who believes. For there is no difference between Jew and Greek: The same Lord is Lord of all, and gives richly to all who call on Him, for, "Everyone who calls on the name of the Lord will be saved." To all of you whose comments I have read - thank you for the encouragement. Even so come quickly Lord Jesus. Gary thank you for the website and the work that goes into the site.